Ashwamedh engineers and consultants laboratory perform analysis of swimming pool water testing servies as per require standards and parameters. We have carved an incredible place in this domain by presenting a supreme quality gamut of Water Analysis for Swimming Pools. Before being delivered to our customers, the provided range is checked properly on assorted parameters of quality. 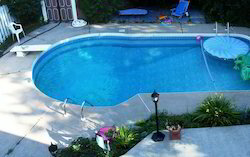 SWIMMING POOL, STEAM, SAUNA, WATER BODY, WATER FEATURES, etc.